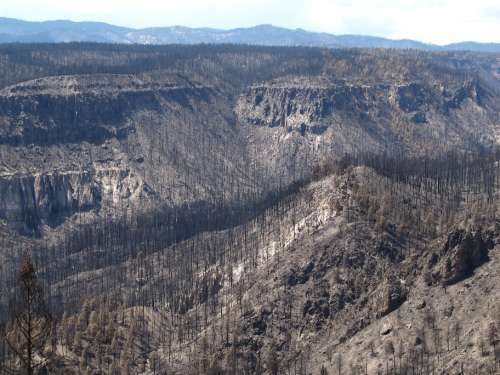 Extensive, contiguous mortality of piñon pine, ponderosa pine, and Douglas-fir trees, killed in the first afternoon and evening of the 2011 Las Conchas Fire in the Jemez Mountains, New Mexico. Forest drought stress is highly correlated with mortality from poor growth, bark beetle outbreaks, and high-severity fire. USGS photo by Craig Allen. In the current issue of Nature Climate Change, there’s an article about how the rise in temperatures may affect forests in the southwestern United States. Drought is a factor in forest mortality–but so is temperature. By comparing the tree-ring record with climate data, scientists identified two climate variables that can be used to estimate annual regional tree-growth variability: total winter precipitation and average summer-fall atmospheric evaporative demand. Using climate-model projections of winter precipitation and summer-fall evaporative demand to estimate forest drought stress in the future, the team projects 1200s and 1500s megadrought-type forest drought-stress conditions to be exceeded on a regular basis by the 2050s. If climate models are correct, forest drought-stress levels during even the wettest and coolest years of the late 21st century will still usually be more severe than the driest, warmest years of the 1200s and 1500s megadroughts. In fact, the study forecasted that during the second half of this century, about 80 percent of years are projected to exceed megadrought levels. Right…so what does all of this mean? It means that big changes are coming to New Mexico’s forests.